The name of the Doctor may not be one of the burning questions most fans have avidly asked over the years, but having an episode titled ‘The Name of the Doctor’ certainly sets the scene for a very big and important outing, indeed. Unsurprisingly, writer Steven Moffat plays with expectations and , rather than offering a straight answer, instead completely changes the entire fabric and history of the programme while bringing into question not only the Doctor’s name but his entire identity. ‘The Name of the Doctor’ features one of the most interesting settings in Doctor Who history, the planet Trenzalore being the final resting place of both the Doctor and his TARDIS. As the TARDIS continues to die, its dimensional control continues to falter and so the dilapidated TARDIS here is impressively large on the outside. But on the inside lies the crux of the episode since a tear in space and time that is connects the Doctor’s adventures and lives has formed. Before Trenzalore even appears on screen, though, ‘The Name of the Doctor’ gives fans a taste of what they were likely hoping for all along in this fiftieth anniversary series. The actual anniversary special is still months away, but here Clara is seen interacting with previous Doctors and voicing over a nice montage of every previous actor to play the role. The manner in which Clara is inserted into these scenes to match the stock footage is superb, and it’s satisfactorily surprising that Clara helped William Hartnell’s first Doctor actually choose which TARDIS to take. Usually more discrete and behind the scenes but sometimes more overt, Clara in her many versions has been a constant through the Doctor’s lives as she tries to save him. Even if it takes time to fully explain everything, this episode give a very satisfying answer regarding the mystery and overall story of Clara in a very logical manner. 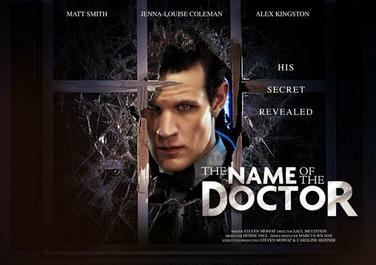 It also takes some time for the Eleventh Doctor himself to appear, but the returning supporting cast of Strax, Jenny, Madame Vastra, and even River Song- whose story seemed to have reached its conclusion in ‘The Angels Take Manhattan- are more than up to the task alongside Clara of setting the scene and pushing events in motion. The conference call amongst these characters gives a brief respite from the more dramatic events at hand, but it’s through this clever device that the Ominous Whispermen are met. Unfortunately the villains, including the visually stunning Whispermen, prove to be the only real mild disappointment of the story. Their slower manner and menacing whisper are certainly suitably creepy, but they are quite difficult to understand and never fully reach their potential, almost as if Moffat doesn’t want to fully explot them in their first appearance. Still, the demise of Catrin Stewart’s Jenny at their hands with such a casual mention of being murdered during the conference call is extremely effective. Alongisde the Whispermen is the return of Richard E Grant as the embodiment of the Great Intelligence. However, as strong and menacing as he is in the role, and considering how long the Great Intelligence has been around in the history of Doctor Who, he, too, seems quite underutilised. He unquestionably helps to drive the story forward as access to the space-time breach and the Doctor’s lives is gained, but given that he’d put two appearances in recently and seemed poised to become a monstrously overwhelming threat lurking in shadows, the rapidity of his story’s apparent resolution is a little underwhelming. As the Doctor enters his own timeline after Clara herself enters the rift to put right the newfound wrongs after the Great Intelligence tries to take over the Doctor’s timeline, all best are off as Moffatt and Doctor Who deliver possibly the biggest cliffhanger in its lengthy history. Put simply, in between the running cascade of previous incarnations of the Doctor stands John Hurt, introduced here as the Doctor as well. Intriguingly, Matt Smith’s Doctor refuses to call him the Doctor, though he does admit that it is him, and states that this new persona is the one who broke the promise. The early thoughts would be on that promise and the Doctor’s stated lack of a choice relating back to the Time War given how much guilt he has been carrying since the Eccleston’s Doctor ran onto screens in 2005. Regardless of the actual identity of John Hurt’s Doctor, this is a huge revelation that will shake the very foundation of Doctor Who going forward. Full credit goes to everyone involved for keeping this secret under wraps until transmission in this era of spoilers, and the result is one of the greatest moments in almost fifty years. This is the biggest and undoubtedly the most satisfying of Steven Moffat’s series finales to date, unafraid to jump into the show’s history and bring out even bigger questions for the future. After a somewhat unsteady run of episodes that definitely had some highs and lows, this is pretty much a perfect ending for this series before jumping into the proper fiftieth anniversary special in November.